No items in the project list. Could An Outdoor Wedding Be In Your Future? Every bride dreams of how her wedding will be. Most of us know how we want the flowers and details of our weddings to turn out, but what about the venue? There are so many options for where to host your wedding, and for some couples, they just know that they want theirs to be outside. The thing to remember about outdoor rentals is that even if you book the venue, they still may not have all the amenities you need or want for your wedding. Some places may even charge extra for amenities in addition to rental and fees, but this is not the case everywhere. But you can have a wedding outside without spending every bit of money you have! Here’s how. If you know someone that has a lot of land and is willing to host weddings, you could have your wedding outdoors for free or at a steep discount of what you would pay normally. This cuts back on the amount you’ll pay for a venue and you’ll be able to spend that money on other aspects of your wedding. There may even be ranches near you that are willing to rent out their space. Remember that you need enough room to put down a dance floor. People will most likely want to dance, so don’t forget setting up music to set up a dance floor too if you’re having your reception outdoors instead of a separate location. Tents provide shade during the day and a cover during the night and against weather. They are usually a choice that most couples look back on and don’t regret spending the money. Remember you need tables and chairs too. Whether it’s chairs for the ceremony or tables for the reception, remember that you’ll most likely require tables, chairs, and even tablecloths and center pieces. Make sure that you have features that will stand up to wind and any light weather too. An outdoor wedding is a chance to take advantage of the beauty of nature. It’s the perfect setting to say your vows to the person you love. 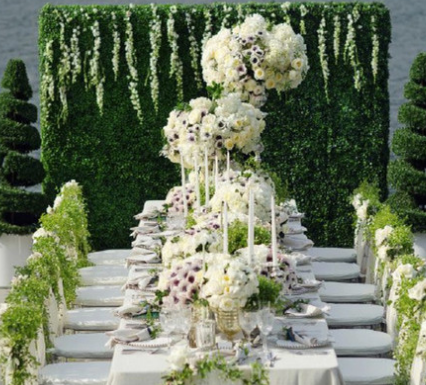 Consider an outdoor wedding for your upcoming event– they truly are not only special, but memorable too.